Global Health Sciences, Inc. was a vertically integrated developer and custom manufacturer of dietary and nutritional supplements which supplied Herbalife with the large majority of its products.In the year prior to the sale, revenue and EBITDA were approximately $250 million and $45 million, respectively; however, the potential loss of Herbalife and over-capacity resulting from an industry downturn was causing capacity concerns and margin pressure. It was necessary to identify strategic buyers that would not be discouraged by the current industry conditions. Four strategic buyers presented offers, recognizing the value of the management team's experience and the potential of the underutilized facility. 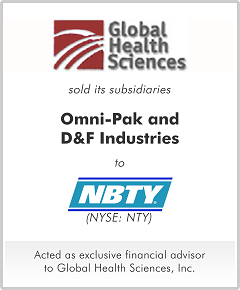 The sale was consummated through an auction process with NBTY Inc., a large public competitor, emerging as the highest and best bidder for Global Health's two largest manufacturing subsidiaries.